Cook 300g Kinmemai better brown rice as per cooking instruction with 450ml water. Do not wash the rice. Heat 1 tbsp oil on medium heat in a non-stick pan. Saute diced white onions until translucent. Add in diced chicken and cook for 1-2 minutes. Stir in 30g diced carrots and 30g green peas. Cook for a minutes. Add in Kinmemai better brown cooked rice. Stir fry for 2 minutes. Pour in tomato ketchup followed by 1 tbsp water, stirring until ketchup sauce is reduced and each grain of rice is separate and coated in a shiny sheen of ketchup. Mould a quarter of the rice into an oval shape mould onto a plate. Beat 3 eggs in a bowl. Using a kitchen paper towel, dip into the bowl of oil. Lightly grease an 8 inch non-stick pan with oil on medium heat. Immediately stir them up with wooden chopsticks to scramble. When the eggs are about 50% cooked, pour it back in a bowl. Whisk gently using a pair of chopsticks. Clean the pan. Lightly grease with oil. Tilt the pan toward you. Pour the egg mixture back into the pan, to form a crescent. Using a spatula, fold the edges, followed by the centre to form an oval shape. Gently flip the egg to fold it into 2. Tip the pan for the fire to heat the edges, to seal the side seam of the omelette. 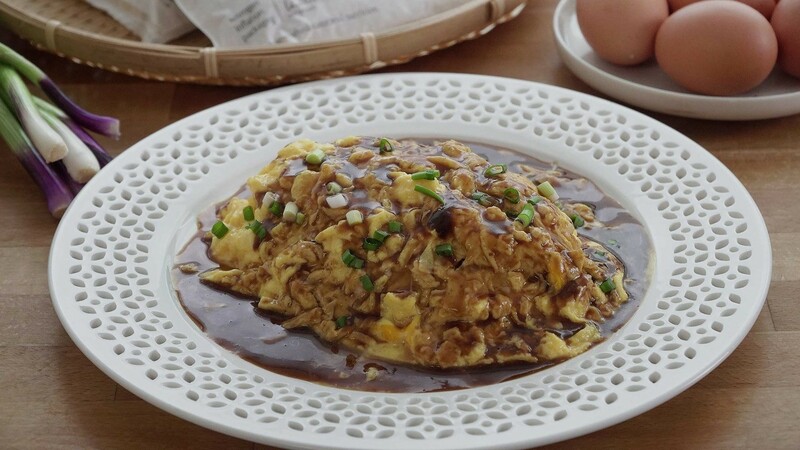 Gently roll the omelet towards and away from yourself, and place it on top of the fried rice. Repeat with remaining fried rice and eggs. Using a knife, gently slice the omelet, it will fall open and cover the rice with a soft, saucey scramble omelette. Drizzle demi-glace sauce over it. Garnish with chopped spring onions.